The spiders, all species from South America, were recovered from a property in Aberdeenshire. Eleven abandoned tarantulas rescued from a house in Aberdeenshire are seeking a new home. The eight-legged creatures, all species from South America, were recovered from a property by the Scottish SPCA after being deserted by their owner. 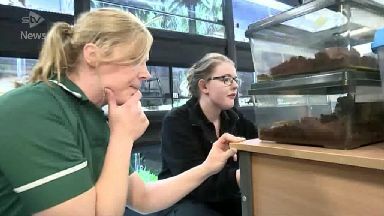 The spiders, some of which are venomous, are now being cared for at the rehoming centre in Drumoak. Now staff are looking for experienced owners to adopt the furry friends as pets. Louise Griese, the assistant manager at the centre, says: "It's unusual to have eleven tarantulas. "We had just one in the last eight years. "It's a learning curve for all of us but we're all getting quite attached to them believe it or not." Gayle Marr, a vet nurse with special knowledge of spiders, has been brought in to give advice. She says, "We wouldn't recommend handling tarantulas. "But they're an interesting variety of species. "They do have venom in them but it's more akin to a bite or a sting."